isti and maguirejp like this. Boneto Cinturini offers vanilla scented straps made from NBR rubber. Much better than the dust gathering silicone straps you often find on Ebay. And they are a LOT cheaper than an Isofrane. Expect to pay $20 to $30. Meranom sells a Tropic style rubber strap that's quite affordable. It is silicone, but it is pretty nice. It uses normal style spring bars rather than the fat style ones that I prefer on a rubber strap because it is a little on the thin side. I think the vintage-looking tropic style looks more at home on a Vostok than an Isofrane style strap imho. Last edited by JedIsDead; June 6th, 2017 at 19:33. I found this on Ebay. Looks awesome, but can't say anything about it. It would look great on a scuba dude. Ticonderoga and maguirejp like this. My first attempt at a relume with noctilumina in a 670 case. I found the new 12,3,6,9 dial was actually a really dark grey. So I swapped it over for the older date version which has a really rich deep black much more suited to the deep black Dagaz insert. Completed with a Dave Murphy bezel and Corvus bond strap. I love it. Ticonderoga, mxm, taimurkhan and 6 others like this. Very nice! So how difficult is reluming? If you're just doing dots & hands (if you're comfortable removing & re-setting hands), not difficult at all - give it a shot. My first attempt at a relume with noctilumina in a 670 case. How many attempts or how difficult did you find it to achieve the right ratio of powder to binder? How long did the lume in your mixing pot last before getting too dry to work with? Last edited by saturnine; June 8th, 2017 at 16:40. It was easier than I thought really. I just mixed until thought it was right. 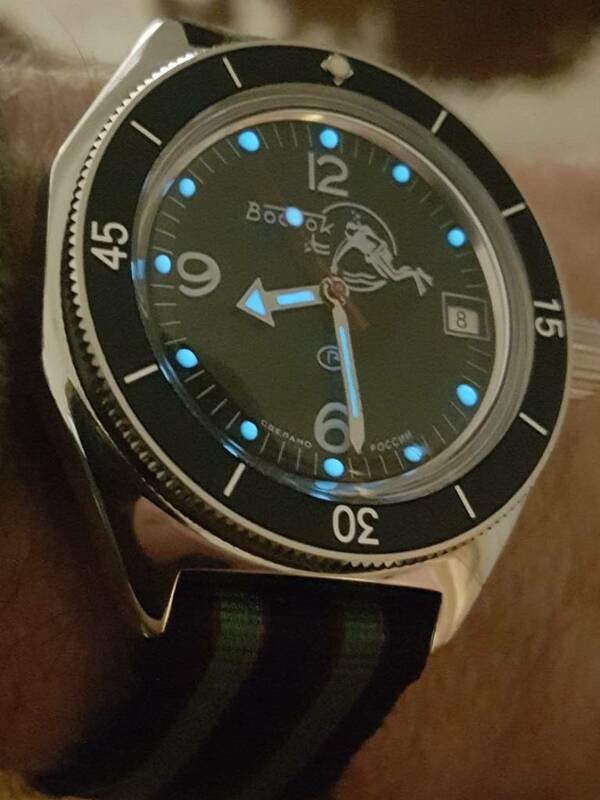 I practised a few times dropping dots on an old dial to make sure the lume wasnt to runny or too dry them just applied dots. The hands were a little trickier but I just thinned out the mixture a bit more to allow it to flow a little more. Mixing the lume I find, is all about a softly softly approach. Definitely use a loupe when applying. As far as drying time goes it was quite cold when I did this so I had plenty of time. I probably could have done 2 dials easily. You can always add thinner which is supplied if it does dry out too much. Give it a go just take your time. Last edited by randb; June 8th, 2017 at 21:50.
saturnine and nckwvr like this. randb, nckwvr, DocTone and 1 others like this. nckwvr, greyfellow, jetcash and 13 others like this.